1+2= N Sato Natsuki | Where's Natsuki? Natsuki Sato, was a member of the Japanese idol group AKB48. 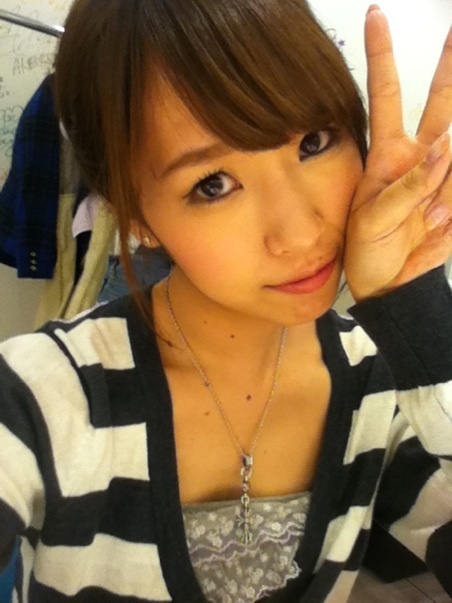 Natsuki is an original Team K member and debuted on April 1, 2006. She was regrouped to the New Team B at the final Budokan Concert in August, 2009. In August 2012, she was again switched, this time to Team A.
Natsuki has been included in the AKB48 sub-group “Ice from AKB48” with Erena Ono, Yūko Ōshima, Tomomi Kasai, and Yuu Imai which recorded the theme song Aisareru to iu Koto for ICE (アイサレルトイウコト for ICE) used in the anime ICE. In 2007 and 2008, Natsuki joined Kayo Noro to create the comedian duo Nacchinon (「なちのん」). They participated in multiple comedy competitions, but never placed. This group is often used in MCs at AKB48’s various concerts. On December 20, 2008 at AKB48’s first concert in JCB Hall, it was announced that Natsuki was admitted to the prestigious Waseda University. Natsuki has been invited to the popular quiz show Q-Sama!! (「Ｑさま！！」) multiple times. In her first appearance, she was partnered with Sakiko Matsui, the only other college student in AKB48 at the time, while her subsequent appearances do not include any other AKB48 members. On May 4, 2010, Natsuki was officially announced as being under the management of Watanabe Production’s Biscuit Entertainment. As of May 28, 2010, she was allowed an official public blog hosted on her agency’s site. On July 11, 2010, Natsuki was announced to have been grouped into the “Girls・ING” (「ガールズ・ING」) unit for the Ameba Team Pigg Unit Battle as a chance to participate in AKB48’s 18th major label single, “Beginner,” as one of the B-sides. Other members chosen for the unit are Ayaka Umeda, Ayaka Kikuchi, Asuka Kuramochi, Haruna Kojima, and Rina Chikano. “Girls・ING” achieved third place in the tournament with 108,575 votes, and did not get to use their song “Uso Desho?” (「嘘でしょ？」), which would be a “quick-paced pop song about girls’ feelings. The song was later released at the beginning of 2011 in No3b’s first self-titled album, due to Kojima Haruna’s inclusion in both units. Roughly a week later on July 18, 2010, Natsuki announced that she would have a lead position in an annual September production of “IMAGINE9.11,” a play which focuses on terrorist attacks in the United States in 2001. She played a girl named Natsuki who suffered from leukemia and also was the center of the idol group SM8 (Sugar Moon 8). AKB48 held a luck-based tournament to be selected for positions in the 19th major label single, Chance no Junban (「チャンスの順番」) on September 21, 2010. There, AKB48 members played Jankenpon, or Rock-Paper-Scissors. Natsuki won seventh place in the contest and was then selected for a single for the second time, the first being the 3rd major label single in April, 2007. For AKB48’s fourth annual Top 100 concert, the series of four performances showcasing the 100 most popular fan-voted songs, Natsuki was announced to be in Team Z, a 16-girl promotional sub-unit for a pachinko game coming out shortly after with their song “Koi no Onawa” (「恋のお縄」). In July and August, 2011, Sato performed her third musical, “Dump Show”. In this musical, she is double cast as a lead in the Moon pair along with Amina Sato in opposition the Sun pair of Oya Shizuka and Asuka Kuramochi, with Oya sharing her part. Sato plays Akane, the lead character’s childhood friend. Natsuki went on to be on a regular radio show with MC Minshiru, “Asian K-Pop Powered by Love-1” on Tokyo FM. She also hosts the weather segment of popular news show “Hiruobi” on TBS every week.